READERS' PICK: Why don't we do it in the road? 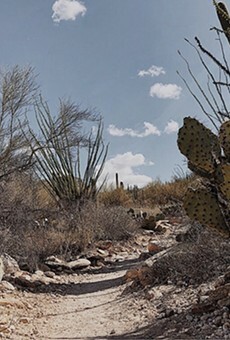 Many intrepid hikers among us will question the value of an outdoor experience that doesn't require you to set foot off of asphalt, but that doesn't bother the thousands of locals who habitually tramp up and down the old three-mile-plus road snaking through this lush cut in the Catalina foothills. You get plenty of opportunities to kick up some dust, too, with trails heading off into the wild. Try the Blackett's Ridge trail sometime, if you're ready for a good but not too long workout on a steep little path with magnificent views at the top. B-SIDE: Starr Pass, West Anklam Road and Players Club Drive (about a half-mile west of Pima Community College West Campus). Drive up the winding road past Moonrise Luxury Apartments, half-built McMansions and unnaturally green golf courses and you come to a dirt road, east of Players Club Drive and Starr Pass Boulevard, leading to two parking areas. Unload your hiking boots or mountain bike, put on the sun hat and prepare for the beauty--the sprawled city below meets mountains rising to a majestic ring that is our valley. Offshoots of the discernable path beg exploration (it's part of the David Yetman and Golden Gate trails). But the main one yields a blessed trickle of water. You know what that means: a David Dunn experiment in music-making (he called his "Chaos and the Emergent Mind of the Pond"); here it's a soundscape of crickets chattering, flies buzzing, manic hummingbirds humming, the thwack of birds' wings, the clacking of lizard toes scampering over cool rocks. Close your eyes, listen to the abundant symphony emerge.